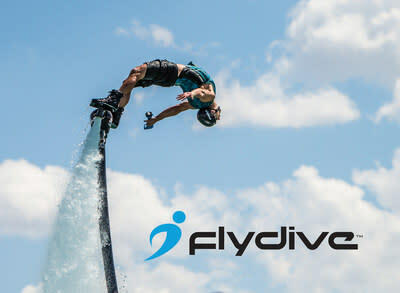 FlyDive continues to aggressively grow their business. Below is the press release. SAN DIEGO, Jan. 12, 2017 /PRNewswire/ — FlyDive, a leading U.S. manufacturer of recreational hydroflight watersports products, today announced the acquisition of Jetpack America, an industry leader in hydroflight experience rentals and product sales, for an undisclosed sum. Founded in 2011, Jetpack America was one of the pioneers in the emerging hydroflight industry, providing water jetpack and jetboard sales and rentals in several locations in the Southwestern U.S., including San Diego, California and Pahrump, Nevada. The company has been renting jetpack and jetboard experiences to recreational watersport customers since the inception of hydroflight, conducting more than 30,000 flights, and has become a leader in the industry. In the Summer of 2016, the company, led by owner Dean O’Malley, produced the largest open-format hydroflight competition in the world, Hydro-Fest, featuring all major types of water-jet-powered products (such as jetpacks, jetboards and jetbikes) piloted by top international athletes. Jetpack America’s goal is to bring hydroflight experiences to the mass market of recreational watersports enthusiasts, and additionally to help other industry resellers to become successful in renting and selling hydroflight products – they do this by empowering collaboration through a focus on highest quality hydroflight instructional training and product expertise. Founder Dean O’Malley is looking forward to working closely with FlyDive management to develop future business opportunities, strategic partnerships and best practices for growing FlyDive and Jetpack America business, and helping to further hydroflight technology and product innovation aimed at advancing the industry. Jeff Elkins talks Jetpack Invasion, Flytronics and more!